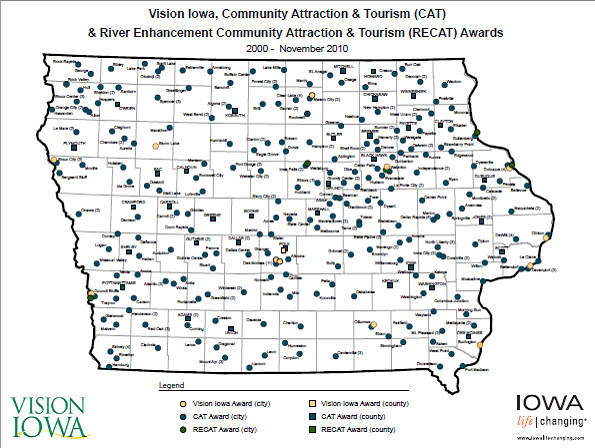 Congratulations to the Wieting Opera House for being the latest Tama County recipient of the Vision Iowa Community Attractions and Tourism grant! Yesterday the project was formally awarded $218,000 to support the $1.2 million historic renovation project fundraising efforts. Project leader Jim Roan reports that $755,673 has been raised and pledged to date, and stresses that fundraising efforts continue. A special thank you to the 450 individuals, businesses, organizations and governments who recognized the importance of this project and have contributed to it to date. The goal is to have the theatre restored in time for the 100 year anniversary in 2012. The Wieting Opera House is on the National Register of Historic Places.